The liberties referred to relate to my processing of the first of today’s images. Taken well after sunset, hand held and at ISO 32,000, something which a few years ago would have been considered impossible. After my recent post about being subtle with processing, today, I’ve done an about face and pushed the processing considerably. Hypocritical? Well horses for courses and in this instance I intentionally set out to create something a bit unsettling, a bit “other worldly”. The operative word there is, intentionally. This isn’t a careless exercise in simply and thoughtlessly throwing a bunch of digital effects onto an image willy nilly! Paddle boats secured for the night. Sanur Beach, Bali. The second image was taken on the same evening but in this instance at lower ISO with the camera supported. In this case a slow shutter speed was used to allow some motion blur to occur. In this case I hoped to create an evocative mood, whether I succeeded or not I’ll leave to the viewer to decide. 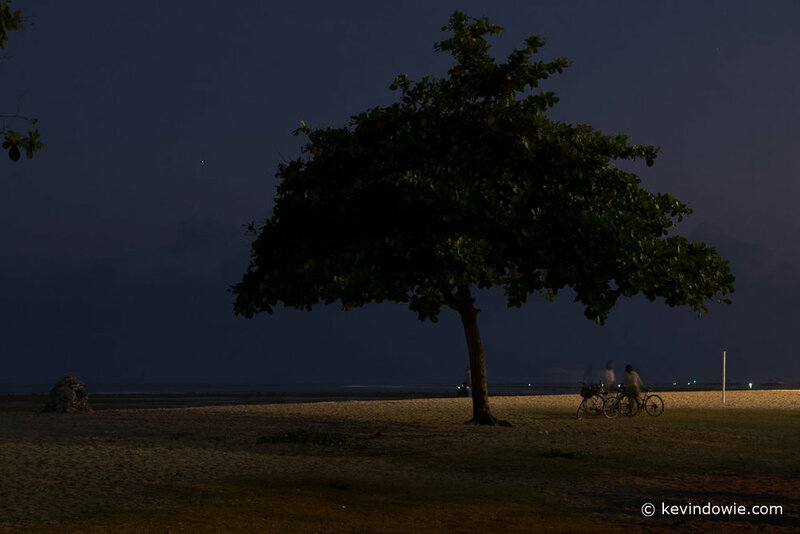 Collecting the bicycles, Sanur Beach, Bali.